A diver’s ability to know precisely where they are in relation to the shore or boat is fundamental to every good dive plan. The greater the diver’s proficiency in the techniques of underwater navigation the easier it becomes to know not only where they are at any point during the dive, but also where they’re going. It’s a skill that, once mastered, helps moderate the subtle stress and higher breathing rate often associated with disorientation; one that gives the diver a greater degree of control over proper gas management, that reduces the need for lengthy – and potentially exhausting – surface swims, and that adds to the safety and pleasure of the dive. With these considerations in mind, all divers should have an understanding of the problems posed by the environment and a basic knowledge of standard navigation techniques using both natural aids and instruments. Inspired by gravity and the two-dimensional comfort of land, most of us have no difficulty in navigating around our neighbourhood, especially on a clear, sunny day. In the denser, three-dimensional environment of the ocean accurate natural navigation over even short distances often becomes fraught with difficulties. Because water is a denser medium than air, one that readily holds organic and inorganic particles in suspension, the divers range of vision is limited. Even in the clearest of waters it’s difficult to clearly distinguish objects little further than a hundred metres or so away. (Sadly, it’s rare to find a location where the underwater visibility is constantly that good. More often than not the visibility is measured in single digits.) Coupled with this is the angle at which the objects are viewed. On land, with our feet firmly anchored to the ground, we tend to view our surroundings from the same perspective. If we know the area well then it’s relatively easy to distinguish one landmark from another. At a pinch we can even – depending on the extent of any cloud cover – orient ourselves according to the position of the sun or stars and the time of day. Beneath the surface things change: near weightless and now able to move up and down, as well as forward, backward or from side to side, the diver is subject to the influences of an aquatic environment. Currents and tidal flows – even those with no more force than a gentle surface breeze – impact on the diver; apparently familiar features like rock and reef formations assume different and sometimes unrecognisable characteristics when viewed from the angle of a different depth; turbid water affects vision and the diver’s ability to gauge direction by focussing on distant objects. Even determining direction by the position of the sun becomes a poor guide in all but clear, calm and shallow waters. That light which is not reflected back from the sea’s surface is diffused by the denser medium, while ripples and waves cause light refraction and constantly shifting shadows. Regardless of the complexity of the dive and the required navigational skills, begin building a mental picture of the dive site by studying marine charts and noting the depth contours of the seafloor as well as its composition. Water movement or a careless fin kick can easily disturb ooze and fine silt deposits, making navigation by visual reference difficult or obsolete. Consult tide tables and, where possible, determine in advance of a dive the strength of the tidal flow and the times of high and low tide. Pay similar attention to local water circulation patterns, the types of current common to the area, their strength and direction. These are often determined by the shape and nature of a nearby shore as well as the prevailing wind and weather patterns, forces that can combine to produce local variations in water movement. Talk with other divers familiar with the area and check out the mud maps that many dive stores compile on popular dive sites in their locality. Although lacking the precision, scale and accuracy of a chart, mud maps will usually contain a lot of detail on features and physical characteristics of the site to help verify the diver’s approximate position. Although an imprecise art and one that’s really only appropriate to shallow waters, (as from a shore dive) having an overall appreciation of the dive site is an important first step when using natural aids to navigation. The more familiar a diver becomes with the dive site, the easier it becomes to navigate around it without reference to a compass. Apart from the ability to recognise certain prominent features of their surroundings, they become more attuned to the tidal flow and its direction. On a featureless seafloor a small handful of ooze or fine silt will, when released, form a small cloud that tends to follow the direction of an incoming and outgoing tide or prevailing current. A coarser sandy bottom will, especially in shallower waters, take on a ripple pattern that always runs parallel to the shoreline. Formed by water deflected back from the land, the tops of these sand ripples have a tendency to curve over towards the shore. Water movements and the actions of the tides have a similar affect on seaweeds and grasses. Swaying towards and away from the shore, the length of time that they will point in any one direction is governed by the water flow; longer towards the shore on an incoming tide and longer away from it on an outgoing one. Depth is another indication of position. Broadly speaking, the deeper the water the further the diver is away from land. Ledges, drop-offs and steeper slopes provide an obvious visual reference, but where increasing depth occurs more gradually – and again, especially in shallower waters – the diver can gauge the extent of their descent without reference to instruments, (but why bother?) by whether or not they have to clear their ears – and how frequently. Sunlight, while an often-quoted aid to natural navigation, is a poor reference source unless the waters are exceptionally clear and calm, especially where heavy cloud cover exists. Even in those situations when the sun is shining brightly, the amount of light penetrating the surface will be governed by the time of the day, the sun’s angle to the horizon and surface ripple and wave patterns. Having knowledge of their underwater swim speed, or the number of fin kicks it takes to cover a measured distance, can also be used as a rough guide in determining the diver’s position in relation to the surface. When diving in areas of poor visibility, new and unknown locations, or where strict accuracy is required, a compass becomes an essential item – as does the ability to use it properly. A good underwater compass for use by divers differs slightly from those used on land and may consist of either a magnetised needle or a free swinging magnetised dial. Etched into the surface window of both is a straight line, known as the ‘lubber line’ that effectively bisects the compass in two. To be of use to the diver, both types have a rotating outer bezel to which is attached two parallel line markers that sit over the window. Although there are variations in the manner in which the degrees appear on the compass, they tend to be shown in increments of 5°. In the case of a popular magnetised dial brand, the dial itself shows the four cardinal points with bolder lines used to mark north and south. Painted clockwise onto the dial in 30° gradations with 10° line indicators, the way in which the degrees are displayed has been reversed from the normal; north is shown as 180° while the 360°/home position is in the south, a feature that allows the diver to read his true heading through a small, side-mounted window in the casing. On the rotating outer bezel, the degrees, marked clockwise in increments of 5°, appear in the normal fashion. A simple illustration of the use of a compass is to point the lubber line in the direction in which the diver wishes to travel. The bezel is then rotated until the north arrow rests between the parallel line markers. Maintaining the position of the north-pointing arrow between the two parallel markers and following the direction indicated by the lubber line allows the diver to move forward in a constant direction. To return back to their starting point on a reciprocal course, the diver turns around until the south-pointing arrow on the compass dial rests between the parallel markers and north lines up with the opposing pointer. Using a compass in the weightless water environment sounds easier than is actually the case and preserving a desired direction is only possible when the diver holds and reads the instrument correctly. This is first accomplished by the diver positioning him or herself properly in relation to the lubber line and visualising that line extending down the entire length of their body, neatly dividing it in to two equal halves. Something that is best achieved by holding the compass as far away from the head as possible and by looking across it, rather than down on to it. For this reason a compass worn on the left wrist and brought into position by extending the right arm straight out in front and bending the left elbow until the diver is able to grasp the right arm on and above the elbow, provides better accuracy in holding a heading than attempting to read a console-mounted compass. Swimming more complex patterns can be as simple a matter as stopping at a pre-determined point and, while still facing the direction of travel, rotating the bezel clockwise by the required number of degrees if the turn is to the left – counter-clockwise if it’s to the right – and moving the body in that direction until the north-pointing arrow is again aligned between the parallel markers. Subject to other influences, however, the diver’s use of a compass alone is no guarantee of navigational accuracy. Swimming headlong into a current, or travelling with its flow, will affect the distance covered while the subtle effects of a crosscurrent will carry an unprepared diver holding a constant compass heading easily off course. In those instances, the diver must ascertain the direction and strength of any current in advance of the dive and be able to factor those variables into the planned route using a chart, a protractor and – if necessary – a calculator. In that regard – and when navigational accuracy is paramount – the use of an easily made swim-board becomes invaluable. 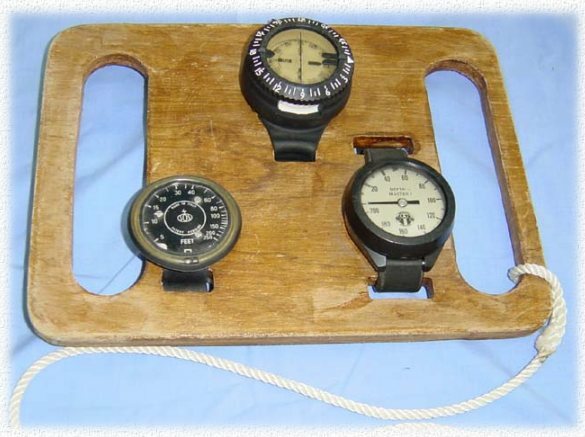 A two-handled board constructed of marine ply or plastic and small enough to avoid unnecessary drag but large enough to accommodate a centrally mounted compass, depth gauge, timing device and slate, the swim-board offers many advantages over a wrist-mounted compass. When held out in front of the diver, it effectively extends the lubber line, a characteristic that permits even greater accuracy in maintaining a heading. Previously armed with knowledge of his or her surface air consumption rate and swimming speed underwater, information on the details of depths to be maintained, compass headings to be followed, distances to be travelled, times and at what point changes to the course direction are to be affected, can be translated to the slate and seen by the diver at a glance. Something that is best learned through constant practice, proficiency in underwater navigation is a confidence building skill that adds immeasurably to the safe enjoyment of every dive.